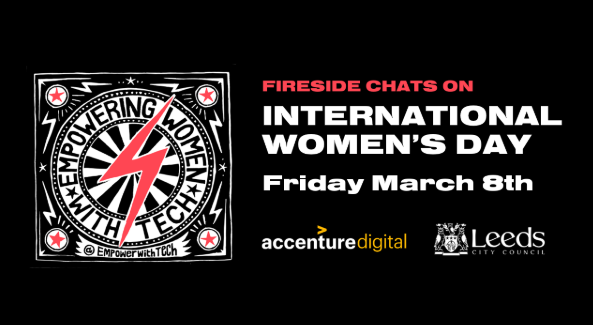 Celebrate International Women’s Day with us on Friday March 8th with an evening of fireside chats with phenomenal role models from Accenture Digital, the European Space Agency, Google, Guardian Newspaper and Leeds City Council. We will get to hear the stories of how these role models got to where they are today. People often don’t start out where they end up, and the story of how they got there is fascinating. Tickets are free and open to all (m/f/gn). We’re so grateful to our event partners Accenture Digital and Leeds City Council for generously supporting this event. *Councillor Rebecca Charlwood, Executive Member for Health, Wellbeing and Adults at Leeds City Council. The speakers will be interviewed by Natasha Sayce-Zelem, Head of Technology for Digital Service at Sky and founder of Empowering Women with Tech. Empowering Women with Tech (@empowerwithtech) is a Leeds based group that works to elevate, educate and empower more women into digital, tech and science careers. Annoyingly only 17% of the Tech workforce are female, with less than 10% are in leadership positions. With the significant role Digital/Technology plays in all of our lives, we need more of us to be active creators, not passive consumers and help shape what the tech products will look like in the future to ensure they meet all our needs. Empowering Women with Tech run a Leeds based mentoring scheme and host events with inspirational role models working across all levels of science/digital/tech (from fashion bloggers to computer scientists/inventors to website entrepreneurs) to show just how varied and exciting the careers paths are, and to break the stigma that tech isn’t creative.